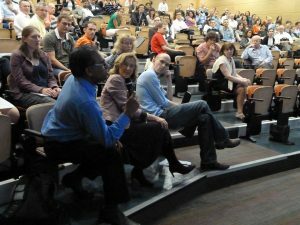 The 10th ENCALS meeting took place from 25-27 May 2012. Young ALS investigators had the change to present there work and discuss with known investigators in the field. May 25th the program started with a workshop on Munix and related measures by Markus Weber, which was a great success. The meeting started with a plenary talk by Dr. Teepu Siddique highlighting the importance of protein turnover in the pathogenesis of ALS based on recent genetic discoveries. Also on Friday there were 2 oral sessions on Applied Epidemiology & Deep Phenotyping and Therapeutic Targets in ALS. The first day ended with a guided poster tour with a cheese and wine reception. On Saturday there were 3 oral sessions; Disease Mechanisms in ALS and Related Neurodegenerations, Cognition and Imaging and Disease Mechanisms, Glia. 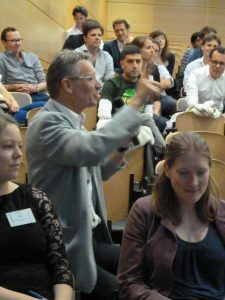 At the end of the day there was a debate with the question: “Has the SOD1 animal model passed its sell-by date?” Professor Wim Robberecht argued in favour of this model and Professor Bob Brown argued against this model. It was a lively and fruitful discussion with a lot of audience participation. After this discussion there was the ENCALS business meeting and a second guided poster tour with wine reception. 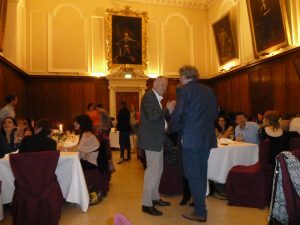 In the evening there was a reception and a very nice dinner in the beautiful Dining Hall of Trinity College. Sunday morning the kick-off was for the ENCALS C9orf72 Consortium meeting. After this meeting the Young Investigator Award was awarded to Dr. Martin Turner. There were 2 oral sessions Sunday morning one on Genetics and Genomics, where Dr. Bob Brown gave his plenary talk with an overview on ALS genetics and future perspectives. The final session was on New Developments in the field. All and all it was a great meeting mainly characterised by a lot of exchange of ideas between young and more senior researchers. We would like to thank the organisers for their great job. Next year we hope to see you all in Sheffield! Please find all photo’s of the ENCALS meeting in Dublin at Picasa.